Unhappy with crooked, discoloured or tired-looking teeth? Always wanted that perfect white smile of your favourite Hollywood star? Veneers are a more conservative approach to dental crowns. Veneers are made to fit over the visible surface of your teeth only, like a false fingernail fits over a nail. 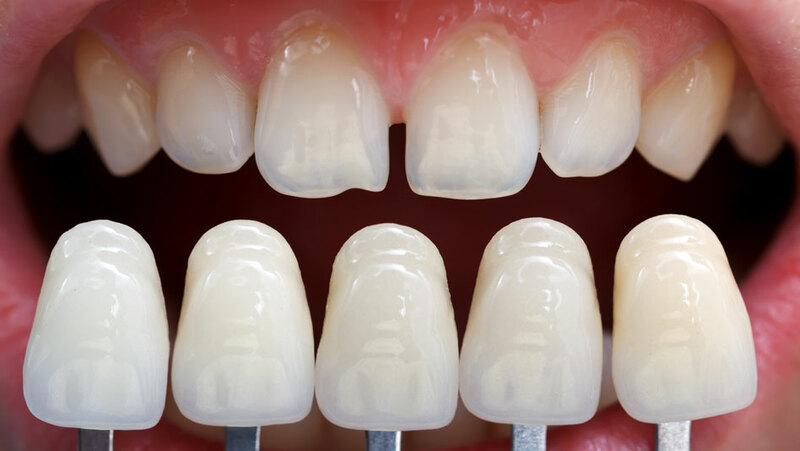 Veneers can be made out of 2 types of materials: porcelain & composite (white filling material). Both types provide highly aesthetic natural results but have their own advantages and disadvantages. Talk to our experienced cosmetic dental team to find out which veneer type is best for you. Call us on 0395570957 to find out more about veneers or schedule an appointment. Porcelain veneers are thin shells of porcelain. Some reshaping of the tooth surface is usually required, followed by an impression of this preparation. Dental technician then uses this impression to make a veneer in a laboratory. The veneer is finally bonded to the tooth to form a strong and natural-looking tooth. For best aesthetics results, tooth whitening is often done before porcelain veneers are made. Composite veneers do not require any reshaping of the tooth surface and are completed in a single visit. They, however, may discolour over time. For best aesthetic results, tooth whitening is often carried out before composite veneers are made. To help you choose the right treatment, we can show you Before and After images of cosmetic dentistry performed for other NMD clients. For porcelain veneers and gum lifts, we can produce a resin mock-up to help you to visualise the treatment proposed.